Samsung recently announced the Galaxy A10, A30, and A50 in its 2019 Galaxy series, with more to come soon. Now, a new leak suggests that the Galaxy A60 is also on its way and some details on its specs have surfaced. 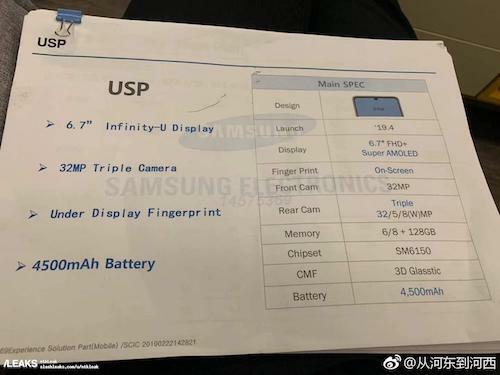 According to a leaked spec sheet by SlashLeaks, the alleged Galaxy A60 is expected to come with an in-display fingerprint scanner as its USP. However, there is no word on the nature of the sensor. The device is likely to come with an Infinity-U display rated at 6.7-inch and Full HD+ AMOLED in nature. The Galaxy A60 is speculated to be powered by a Qualcomm Snapdragon processor with the model number SM6150. It is expected to come in two RAM/ROM variants: 6GB/128GB and 8GB/128GB. The camera department is likely to house three rear cameras rated at 32MP, 8MP (wide-angle lens), and 5MP. On the front, it could house 32MP selfie shooter. Additionally, the Galaxy A60 could get its fuel from a 4,500mAh battery and possibly run Android 9.0 Pie. However, the aforementioned information is a leak and can’t be deemed concrete. To know more about the Samsung Galaxy A60, we need to wait until April 2019 which is the expected launch time of the smartphone. So stay tuned to Fossbytes for more information. Hey Buddy!, I found this information for you: "Samsung Galaxy A60 Could Sport Triple Cameras, In-Display Fingerprint Sensor". Here is the website link: https://hacknews.co/tech/20190305/samsung-galaxy-a60-could-sport-triple-cameras-in-display-fingerprint-sensor.html. Thank you.